Background: Primary spinal infections are rare pathologies with an estimated incidence of 5% of all osteomyelitis. The diagnosis can be challenging and this might result in a late identification. The etiological diagnosis is the primary concern to determine the most appropriate treatment. The aim of this review article was to identify the importance of a methodological attitude toward accurate and prompt diagnosis using an algorithm to aid on spinal infection management. Methods: A search was done on spinal infection in some databases including PubMed, ISI Web of Knowledge, Google Scholar, Ebsco, Embasco, and Scopus. Results: Literature reveals that on the basis of a clinical suspicion, the diagnosis can be formulated with a rational use of physical, radiological, and microbiological examinations. Microbiological culture samples can be obtained by a percutaneous computed tomography-guided procedure or by an open surgical biopsy. When possible, the samples should be harvested before antibiotic treatment is started. Indications for surgical treatment include neurological deficits or sepsis, spine instability and/or deformity, presence of epidural abscess and failure of conservative treatment. Conclusion: A multidisciplinary approach involving both a spinal surgeon and an infectious disease specialist is necessary to better define the treatment strategy. Based on literature findings, a treatment algorithm for the diagnosis and management of primary spinal infections is proposed. According to the anatomical location, primary spinal infection might be described as: (1) vertebral osteomyelitis, (2) discitis and spondylodiscitis, (3) spinal canal infections (epidural, subdural, and intramedullary abscess), and (4) paraspinal soft-tissue infections. Risk factors predisposing the development of a spinal infection are age (usually under 20 or over 50 years), chronic diseases (diabetes, kidney failure, cirrhosis, cancer, and rheumatologic diseases), medical procedures (chemotherapy, previous spinal surgery, dialysis, and presence of central venous catheter), immunosuppression (iatrogenic or host related), and use of intravenous drugs (IVDU). In endemic areas, Brucella More Details and tuberculosis might represent the main cause of spinal infection.,,, The aim of this review article was to identify the importance of a methodological attitude toward accurate and prompt diagnosis using an algorithm to aid on spinal infection management. We searched PubMed using the terms discitis, primary spinal infections, spondylodiscitis, conservative treatment, and surgical treatment for studies published in English literature between January 1, 1990, and November 30, 2018. Subsequently, we screened the bibliographies of the retrieved articles. In this review, we concentrated mainly on published series that involved >10 patients. Based on the aforementioned keywords, only a few studies were multicenter or prospective,, or systematic reviews.,,, No randomized trials for the treatment of spontaneous spinal infections were found although randomized studies for the prevention of postoperative spinal infections exist., Most studies identified were heterogeneous in design with variable inclusion criteria based on age, etiology, patient groups, and use of a particular diagnostic or treatment modality; direct comparison between studies was therefore not possible. Treatment strategies of primary infection of the spine still remain controversial. Conservative cases are often followed by mechanical back pain than surgically treated cases. On the other hand, delayed surgical treatment involves a significantly poorer surgical outcome. A better surgical outcome can be achieved by choosing the most appropriate, and ideally a minimally invasive, approach. Among the issues, the optimal duration for antimicrobial treatment is still unclear, in surgical as in solely conservative treatment. Observational studies reported a significantly higher recurrence rate for treatment duration of <8 weeks, compared to antibiotic treatment enduring longer than 12 weeks. However, the only randomized controlled trial on the topic established no differences in the outcome after administration of 6 and 12 weeks of tailored antibiotic treatment. Accordingly, shorter medical treatment seems to be sufficient in most of the cases. In this scenario, made by unsolved issues, the aim of this review was to identify a working algorithm to support on spinal infection management. The infectious process can spread to the spine by (1) hematogenous dissemination, (2) external inoculation, and (3) diffusion from contiguous tissues. Hematogenous dissemination is the most common occurrence and involves mainly the arterial circulation. However, under particular circumstances, the infection can disseminate from the pelvic venous circulation through Batson's valveless venous plexus., The most represented localization in cases of hematogenous spread is the lumbar spine (58%), followed by thoracic (30%) and cervical (11%) spine. External inoculation is the result of medical treatments (i.e., spinal surgery, lumbar puncture, and epidural procedures). It affects the minority of patients and involves the posterior elements of the spine, as in tuberculosis and fungal spondylitis., The contiguous diffusion is rarely observed and may be related to upper respiratory tract or mediastinal diseases such as esophageal perforation, retropharyngeal abscesses, or infection of aortic implants. The localization of the infection in the intervertebral disc is frequently associated with an involvement of the adjacent vertebral endplates, with or without the extension into the spinal canal (epidural, subdural, or intramedullary abscess). The anatomical basis for this phenomenon is related to the vasculature of the adult spine that is of terminal type. Accordingly, the septic emboli are expected to involve the vertebral body and its surrounding area. In children, the large anastomotic vascularization involving the disc is responsible for the selective disc localization which is reported quite exclusively in the pediatric population. In industrialized countries, the most common pathogen identified is the Staphylococcus aureus. In spinal infection, the incidence of methicillin-resistant S. aureus (MRSA) varies from 6.8% to 30% of the cases, mostly in patients with specific risk factors (IVDU, intravascular devices, and hematological diseases). Tuberculosis is the most represented pathogen worldwide for spondylodiscitis, with an incidence of 46% in developing countries. In industrialized countries, it is found in immunosuppressed people and in those coming from endemic areas. Tuberculosis involves mostly the thoracic spine, with extension in additional segments of the vertebral column. Brucellosis More Details represents the predominant cause of spinal infection (21%–48%) in endemic areas of the Middle East and Mediterranean Basin. The diagnosis relies upon three cornerstones: physical examination, blood tests, and imaging. Pain (axial and/or radicular) is the most encountered symptom, typically constant and worsening during the night. However, up to 15% of patients can be pain free. Fever is less common, being present in 48%–63% of cases,, with a reduction to 17% in tuberculosis. Neurological impairment, due to spinal cord or root compression, might be encountered in about one-third of the patients. Motor weakness to the upper and lower limbs, sphincter function, and sensory loss to the trunk and limbs must be carefully evaluated. Laboratory findings include erythrocyte sedimentation rate (ESR), C-reactive protein (CRP), and white blood cell (WBC) count. Among these markers, WBC count has low sensitivity and ESR has low specificity. An elevation in CRP values might be encountered in >90% of spondylodiscitis cases, and its return to normal values after adequate therapy has been considered to be the best marker for treatment response. Blood cultures should be obtained in every case in which there is a clinical suspicion for spondylodiscitis. They can be diagnostic in up to 70% of patients, not only in cases with fever but also in clinically bland cases and afebrile patients. At least two to three pairs of blood cultures should be obtained, for aerobic, anaerobic, fungal, and mycobacterial agents. If a Gram positive is identified in blood cultures, an echocardiography should be obtained to exclude the presence of endocarditis. First-level radiological investigations include X-rays, computed tomography (CT), and magnetic resonance imaging (MRI). In the early phase (1–3 weeks) of the infection disease, plain radiographs might not evidence any alteration or show only radiolucency in the vertebral endplate and narrowing of the disc space. Specific radiographic signs of the disease, such as involvement of two adjacent endplates and destruction of vertebral bodies, can be observed in an advanced phase. X-rays should be performed in the early diagnostic phase to evaluate any malalignment (on both coronal and sagittal planes) and could be used during follow-up to evaluate deformity progression. CT can assess bony changes with good sensitivity. Disc hypodensity might be encountered in the early phase, while endplate erosion and vertebral body disruption are signs of a more advanced phase. Sequestra and pathological calcifications are typical of tuberculosis. MRI with gadolinium enhancement is considered the gold standard for the diagnosis of spondylodiscitis and allows a clear visualization of soft tissues and neurological structures. Early signs include inflammatory edema and hyperemia, with hypointensity in T1-weighted images and hyperintensity in fluid-sensitive sequences in both bone marrow and intervertebral discs. After contrast administration, a homogeneous enhancement of the disc space, bone marrow, posterior elements, and paraspinal areas might be seen. In case of uncertain diagnosis or equivocal MRI, a positron emission tomography CT with F-18 fluorodeoxyglucose (18FDG PET-CT) might be performed since this technique has been shown to have a good sensitivity and specificity., Compared to gallium-based single-photon emission CT (SPECT),18FDG PET-CT offers superior image resolution and a good anatomical localization of the uptake site, allowing a clear differentiation between degenerative and infectious pathology., If the 18FDG PET-CT is suggestive for an infectious disease, or the standard imaging combined with laboratory tests and physical examination is suggestive for an infectious disease, a multidisciplinary approach involving spinal surgeons and infectious disease specialists should be undertaken. In cases without neurological deficit, vertebral instability, spinal deformity, or sepsis, the patient should be investigated by a CT-guided biopsy. In the absence of neurological impairment and with stable hemodynamics, the antibiotic therapy should be hold until the cultural samples will be harvested. CT-guided biopsy yield has been investigated in a recent meta-analysis, and the authors reported a yield for detection of the responsible agent of 48%, at the lower end of the previously reported range 31%–91%. In patients with hemodynamic instability, sepsis, septic shock, and progressive neurological impairment, empiric antibiotic therapy should be started while waiting for the results of the microbiological analysis. Particular attention must be paid in collecting samples for both microbiological and pathological investigations since both can be of help in confirming the diagnosis. In cases of patients who received a prior antibiotic therapy, or in case of Brucella or mycobacterial infection, a molecular diagnosis with polymerase chain reaction might be helpful. In case of tuberculosis or Brucella infection, immunological tests in serum or plasma have been shown to be of value. Open biopsy should be reserved in cases of negative CT-guided biopsy cultures since it allows in harvesting sufficient material for cultures., Finally, when the cultures do not permit to identify the responsible agent, an empirical antimicrobial treatment should be started. Treatment of spinal infections has the following goals: (1) eradicate the microbial agent; (2) preserve neurological function; (3) restore spinal stability and morphology; (4) debride and decompress the spinal canal in case of epidural abscess; and (5) promote bone fusion of the involved segments. In the absence of emergencies, the antibiotic treatment should be delayed until samples for cultures are obtained. In case of negative cultures, an intravenous empiric wide-spectrum antibiotic therapy is recommended. Empirical antimicrobial therapy should cover against Gram-positive organisms (staphylococcus including MRSA and streptococcus) and Gram-negative bacilli ( Escherichia More Details coliis the most represented). Accordingly, the recommended treatment should include vancomycin and a third- or fourth-generation cephalosporin. In case of allergy or intolerance, alternative combinations might include daptomycin and a quinolone. Furthermore, dalbavancin has been described as a promising agent against MRSA spondylodiscitis. Empiric treatment should not include coverage against anaerobic, fungal, Brucella, or mycobacterial organisms. For S. aureus and MRSA, there are controversial positions about the duration of antibiotic treatment. According to some authors, in uncomplicated pyogenic spondylodiscitis, 6-week treatment (2 weeks intravenous followed by 4 weeks oral) does not lead to an increase in mortality, relapse, and failure rate if compared to 12-week treatment. Other studies suggest that at least 8 weeks of antibiotic treatment may provide with successful results. For tubercular spondylitis, it has been suggested that 12-month long treatment, using isoniazid, rifampin, pyrazinamide, and ethambutol for the initial 2 months followed by a maintenance therapy for 10 months, can be effective. If no information on sensitivities is available, isoniazid, ethambutol, and rifampin are continued. If isoniazid and rifampin are active, they are continued for 12 months. If other combinations are used, therapy is extended to 18–24 months. Recently, it has been suggested that 6-month antitubercular therapy has a similar outcome of 12-month therapy at 24-month follow-up. Fungal infection requires an appropriate antimycotic treatment, specifically addressed against Coccidioides, Blastomyces, Cryptococcus, Candida, or Aspergillus. Fungal spondylodiscitis might be related to the use of immunosuppressive drugs, prolonged use of broad-spectrum antibiotics, widespread use of indwelling catheters, and acquired immunodeficiency syndrome. Since the antimycotic treatment might have a considerable toxicity, early surgical treatment is often recommended., Pain medications should be always considered since it is the most reported symptom. An operative algorithm of treatment for spontaneous spinal infection is proposed in [Figure 1]. Conservative treatment is the treatment of choice in patients without neurological deficit, spinal instability, deformity, and sepsis or with high surgical risk., Such an approach results appropriate for the majority of pyogenic spondylodiscitis with satisfactory results in 72%–85.7% of patients. Conservative treatment is based on the immobilization of the involved spinal segment with rigid orthosis combined with antibiotic treatment. Orthosis redistributes the load over the adjacent unaffected spinal segments, decreases stress and pressure in the affected area, mitigates pain, and prevents segmental deformity. Furthermore, immobilization with orthosis avoids prolonged bed rest, a procedure recommended in the past in case of spondylodiscitis but nowadays almost abandoned. Some authors suggest the use of an orthosis until complete infection healing or for a period spanning 6–10 weeks. Residual chronic back pain has been described in up to 17.1% of cases of spondylodiscitis, mostly in conservatively treated patients with kyphosis or pseudarthrosis. Known risk related to immobilization includes pseudarthrosis at the involved level in 16%–50% of the cases, which may lead to kyphotic deformity and pain. Conservative treatment should be abandoned if the symptoms persist or worse and if the inflammatory indicators and neuroradiological imaging do not provide signs of normalization. In these cases, surgical management should be considered. Surgical treatment is generally recommended in case of neurological deficit, spinal instability, spinal deformity, sepsis, intracanalar lesion with mass effect, failure of conservative treatment including intractable pain, and patient's lack of compliance for conservative treatment.,,, The goals of surgery are to remove the septic focus, identify the responsible microbial agent, stabilize the affected spinal segment, and promote bone fusion. Furthermore, it allows a rapid postoperative mobilization and a more reliable treatment of pseudarthrosis and kyphotic deformity. Surgery is strongly indicated in presence of epidural abscess, even in the absence of neurological impairment. Spinal cord compression is a surgical emergency. The reported outcomes are worse if emergency surgery is performed after 24–36 h upon the onset of the neurological deficit. The recommendations for the surgical treatment are still controversial. The standard procedure involves debridement of the septic focus, span interposition, and then instrumented stabilization. Many surgical approaches have been proposed, but in the absence of strict guidelines, the treatment depends on patient characteristics and experience/preference of the surgeon. Posterior decompression should be reserved in cases of isolated primary epidural abscesses, in the absence of vertebral bodies or disk involvement due to the risk of spinal instability. Furthermore, for isolated decompression procedure, it has been reported a reoperation rate up to 43%. For the cervical spine, the debridement can be obtained through an anterior approach (discectomy or corpectomy) completed with anterior plating. Posterior instrumentation is recommended in case of multilevel corpectomy. In the thoracic spine, an anterior approach (transthoracic, posterolateral, and thoracoscopic) is generally recommended in monosegmental lesions in the absence of posterior element involvement. In case of extensive bone erosion, an anterior approach can be followed by a posterior fixation. For the thoracolumbar junction and lumbar spine, the same principles might be applied. Debridement can be performed through an anterior retroperitoneal,, lateral transpsoas, or posterior approach, followed by posterior instrumentation. Minimally invasive techniques have also been adopted. Percutaneous screw-rod instrumentation has been described as an alternative to bracing in patients with single-level thoracolumbar pyogenic spondylodiscitis and high functional demands, or as standard procedure after anterior debridement. As an alternative to surgery, percutaneous drainage of paravertebral and intradiscal abscesses has been reported. The follow-up is based on clinical findings and laboratory tests. WBC, CRP, and ESR should be repeated every 10–15 days for the first 2–3 months. If the laboratory results are favorable, the tests can be repeated at 3, 6, and 12 months. Pain and mobility improvement, absence of fever, and normal values of WBC, ESR, and CRP are suggestive for a good clinical outcome. Follow-up MRI is not recommended if clinical findings and laboratory tests are satisfactory since persistence of alterations in radiological imaging has been reported, even after complete recovery.,, If an alteration in laboratory findings is evidenced and/or the clinical status has changed, new imaging is advisable. The rate of recurrence has been reported between 0% and 14%., Although its use is not widespread,18FDG-PET CT seems to be a promising technique in the suspect of relapse. A possible instability during follow-up can be detected performing flexion-extension X-rays. If no response to therapy is evidenced during follow-up, it is advisable to repeat attempts to bacterial isolation. Spontaneous spinal infection should be suspected in any patient with prolonged vertebral pain with or without a history of febrile episodes, laboratory data for leukocytosis, increased ESR, and elevated CRP. Current treatment protocols require treatment by a multidisciplinary team of physicians, including infectious disease experts, neuroradiologists, and spine surgeons. The team will be able to assess the best treatment approach on an individualized basis, whether it is surgical or nonsurgical. Zarghooni K, Röllinghoff M, Sobottke R, Eysel P. Treatment of spondylodiscitis. Int Orthop 2012;36:405-11. Sobottke R, Seifert H, Fätkenheuer G, Schmidt M, Gossmann A, Eysel P. Current diagnosis and treatment of spondylodiscitis. Dtsch Arztebl Int 2008;105:181-7. Marotta N, Di Bartolomeo A, Iaiani G, Santoro A, Delfini R, Landi A. Spontaneous spinal infections: Diagnostic and therapeutic management. In: Méndez-Vilas A, editor. The Experience of Neurosurgery Department of University of Rome Sapienza. Badajoz, Spain: Formatex Research Center; 2015. Gouliouris T, Aliyu SH, Brown NM. Spondylodiscitis: Update on diagnosis and management. J Antimicrob Chemother 2010;65 Suppl 3:iii11-24. Kapsalaki E, Gatselis N, Stefos A, Makaritsis K, Vassiou A, Fezoulidis I, et al. Spontaneous spondylodiscitis: Presentation, risk factors, diagnosis, management, and outcome. Int J Infect Dis 2009;13:564-9. Lebre A, Velez J, Seixas D, Rabadão E, Oliveira J, Saraiva da Cunha J, et al. Brucellar spondylodiscitis: Case series of the last 25 years. Acta Med Port 2014;27:204-10. Mylona E, Samarkos M, Kakalou E, Fanourgiakis P, Skoutelis A. Pyogenic vertebral osteomyelitis: A systematic review of clinical characteristics. Semin Arthritis Rheum 2009;39:10-7. Legrand E, Flipo RM, Guggenbuhl P, Masson C, Maillefert JF, Soubrier M, et al. Management of nontuberculous infectious discitis. Treatments used in 110 patients admitted to 12 teaching hospitals in france. Joint Bone Spine 2001;68:504-9. Dufour V, Feydy A, Rillardon L, Redondo A, Le Page L, Bert F, et al. Comparative study of postoperative and spontaneous pyogenic spondylodiscitis. Semin Arthritis Rheum 2005;34:766-71. Turunc T, Demiroglu YZ, Uncu H, Colakoglu S, Arslan H. A comparative analysis of tuberculous, brucellar and pyogenic spontaneous spondylodiscitis patients. J Infect 2007;55:158-63. Euba G, Narváez JA, Nolla JM, Murillo O, Narváez J, Gómez-Vaquero C, et al. Long-term clinical and radiological magnetic resonance imaging outcome of abscess-associated spontaneous pyogenic vertebral osteomyelitis under conservative management. Semin Arthritis Rheum 2008;38:28-40. Arko L 4th, Quach E, Nguyen V, Chang D, Sukul V, Kim BS, et al. Medical and surgical management of spinal epidural abscess: A systematic review. Neurosurg Focus 2014;37:E4. Corrah TW, Enoch DA, Aliyu SH, Lever AM. Bacteraemia and subsequent vertebral osteomyelitis: A retrospective review of 125 patients. QJM 2011;104:201-7. Rutges JP, Kempen DH, van Dijk M, Oner FC. Outcome of conservative and surgical treatment of pyogenic spondylodiscitis: A systematic literature review. Eur Spine J 2016;25:983-99. Bode LG, Kluytmans JA, Wertheim HF, Bogaers D, Vandenbroucke-Grauls CM, Roosendaal R, et al. Preventing surgical-site infections in nasal carriers of Staphylococcus aureus. N Engl J Med 2010;362:9-17. Cheng MT, Chang MC, Wang ST, Yu WK, Liu CL, Chen TH, et al. Efficacy of dilute betadine solution irrigation in the prevention of postoperative infection of spinal surgery. Spine (Phila Pa 1976) 2005;30:1689-93. Tuchman A, Pham M, Hsieh PC. The indications and timing for operative management of spinal epidural abscess: Literature review and treatment algorithm. Neurosurg Focus 2014;37:E8. Alton TB, Patel AR, Bransford RJ, Bellabarba C, Lee MJ, Chapman JR, et al. Is there a difference in neurologic outcome in medical versus early operative management of cervical epidural abscesses? Spine J 2015;15:10-7. Grados F, Lescure FX, Senneville E, Flipo RM, Schmit JL, Fardellone P, et al. Suggestions for managing pyogenic (non-tuberculous) discitis in adults. Joint Bone Spine 2007;74:133-9. Bernard L, Dinh A, Ghout I, Simo D, Zeller V, Issartel B, et al. Antibiotic treatment for 6 weeks versus 12 weeks in patients with pyogenic vertebral osteomyelitis: An open-label, non-inferiority, randomised, controlled trial. Lancet 2015;385:875-82. Digby JM, Kersley JB. Pyogenic non-tuberculous spinal infection: An analysis of thirty cases. J Bone Joint Surg Br 1979;61:47-55. Lehner B, Akbar M, Rehnitz C, Omlor GW, Dapunt U, Burckhardt I. Standards of microbiological diagnostics of spondylodiscitis. Orthopade 2012;41:702-10. Di Martino A, Papapietro N, Lanotte A, Russo F, Vadalà G, Denaro V, et al. Spondylodiscitis: Standards of current treatment. Curr Med Res Opin 2012;28:689-99. Babinchak TJ, Riley DK, Rotheram EB Jr. Pyogenic vertebral osteomyelitis of the posterior elements. Clin Infect Dis 1997;25:221-4. Cushing AH. Diskitis in children. Clin Infect Dis 1993;17:1-6. Masuda T, Miyamoto K, Hosoe H, Sakaeda H, Tanaka M, Shimizu K, et al. Surgical treatment with spinal instrumentation for pyogenic spondylodiscitis due to methicillin-resistant Staphylococcus aureus (MRSA): A report of five cases. Arch Orthop Trauma Surg 2006;126:339-45. Corti M, Villafañe MF, Palmieri O, Gilardi L. Mycobacterium tuberculosis as etiological agent of adult infectious spondylodiscitis. Rev Clin Esp 2012;212:369-71. Jean M, Irisson JO, Gras G, Bouchand F, Simo D, Duran C, et al. Diagnostic delay of pyogenic vertebral osteomyelitis and its associated factors. Scand J Rheumatol 2017;46:64-8. Pola E, Taccari F, Autore G, Giovannenze F, Pambianco V, Cauda R, et al. Multidisciplinary management of pyogenic spondylodiscitis: Epidemiological and clinical features, prognostic factors and long-term outcomes in 207 patients. Eur Spine J 2018;27:229-36. Landi A, Grasso G, Iaiani G, Gregori F, Mancarella C, di Bartolomeo A, et al. Spontaneous spinal discitis and spondylodiscitis: Clinicotherapeutic remarks. J Neurosci Rural Pract 2017;8:642-6. Fantoni M, Trecarichi EM, Rossi B, Mazzotta V, Di Giacomo G, Nasto LA, et al. Epidemiological and clinical features of pyogenic spondylodiscitis. Eur Rev Med Pharmacol Sci 2012;16 Suppl 2:2-7. Kim SH, Kang MS, Chin DK, Kim KS, Cho YE, Kuh SU, et al. Anterior lumbar interbody fusion for the treatment of postoperative spondylodiscitis. J Korean Neurosurg Soc 2014;56:310-4. Landi A, DI Bartolomeo A, Marotta N, Iaiani G, Domenicucci M, Chiara M, et al. Multidisciplinary management of spontaneous spinal infections: There is a correlation between timing, type of treatment and outcome? A multivariate analysis of an observational cohort study. J Neurosurg Sci 2016. Kim CJ, Song KH, Jeon JH, Park WB, Park SW, Kim HB, et al. Acomparative study of pyogenic and tuberculous spondylodiscitis. Spine (Phila Pa 1976) 2010;35:E1096-100. Duarte RM, Vaccaro AR. 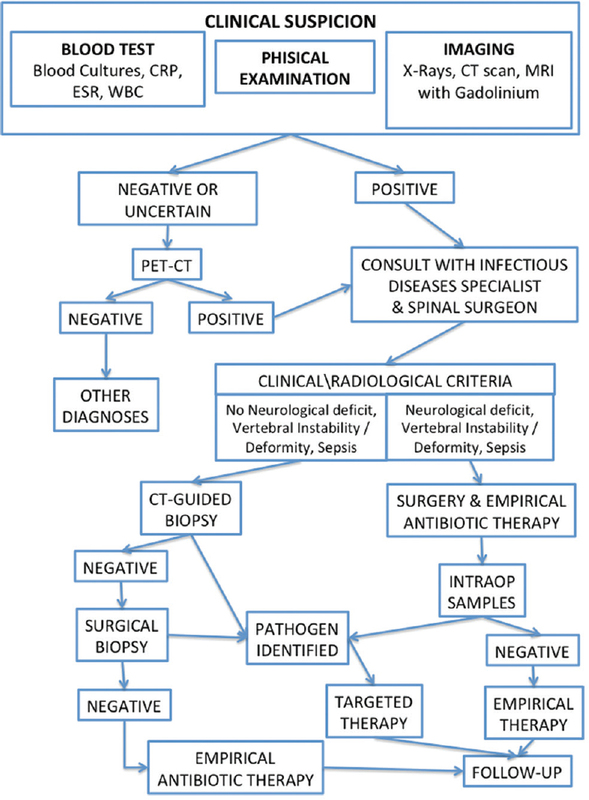 Spinal infection: State of the art and management algorithm. Eur Spine J 2013;22:2787-99. Pigrau C, Almirante B, Flores X, Falco V, Rodríguez D, Gasser I, et al. Spontaneous pyogenic vertebral osteomyelitis and endocarditis: Incidence, risk factors, and outcome. Am J Med 2005;118:1287. Jevtic V. Vertebral infection. Eur Radiol 2004;14 Suppl 3:E43-52. Tins BJ, Cassar-Pullicino VN. MR imaging of spinal infection. Semin Musculoskelet Radiol 2004;8:215-29. Leone A, Dell'Atti C, Magarelli N, Colelli P, Balanika A, Casale R, et al. Imaging of spondylodiscitis. Eur Rev Med Pharmacol Sci 2012;16 Suppl 2:8-19. Schmitz A, Risse JH, Grünwald F, Gassel F, Biersack HJ, Schmitt O, et al. Fluorine-18 fluorodeoxyglucose positron emission tomography findings in spondylodiscitis: Preliminary results. Eur Spine J 2001;10:534-9. Stumpe KD, Zanetti M, Weishaupt D, Hodler J, Boos N, Von Schulthess GK, et al. FDG positron emission tomography for differentiation of degenerative and infectious endplate abnormalities in the lumbar spine detected on MR imaging. AJR Am J Roentgenol 2002;179:1151-7. Gemmel F, Hamerlynck N, Vanderschueren G, Giri M, Goethals I, Jacobs F. Multimodality SPECT imaging of multifocal spondylodiscitis. Clin Nucl Med 2004;29:635-6. McNamara AL, Dickerson EC, Gomez-Hassan DM, Cinti SK, Srinivasan A. Yield of image-guided needle biopsy for infectious discitis: A systematic review and meta-analysis. AJNR Am J Neuroradiol 2017;38:2021-7. Berbari EF, Kanj SS, Kowalski TJ, Darouiche RO, Widmer AF, Schmitt SK, et al. 2015 infectious diseases society of America (IDSA) clinical practice guidelines for the diagnosis and treatment of native vertebral osteomyelitis in adults. Clin Infect Dis 2015;61:e26-46. Lener S, Hartmann S, Barbagallo GM, Certo F, Thomé C, Tschugg A, et al. Management of spinal infection: A review of the literature. Acta Neurochir (Wien) 2018;160:487-96. Almangour TA, Fletcher V, Alessa M, Alhifany AA, Tabb D. Multiple weekly dalbavancin dosing for the treatment of native vertebral osteomyelitis caused by methicillin-resistant Staphylococcus aureus: A case report. Am J Case Rep 2017;18:1315-9. Al-Nammari SS, Lucas JD, Lam KS. Hematogenous methicillin-resistant Staphylococcus aureus spondylodiscitis. Spine (Phila Pa 1976) 2007;32:2480-6. Hyttel TE, Rasmussen S. Tubercular spondylodiscitis in a young woman with thoracic backpain. Ugeskr Laeger 2015;177:42-3. Nene AM, Patil S, Kathare AP, Nagad P, Nene A, Kapadia F, et al. Six versus 12 months of anti tubercular therapy in patients with biopsy proven spinal tuberculosis: A single center, open labeled, prospective randomized clinical trial-A pilot study. Spine (Phila Pa 1976) 2019;44:E1-E6. Colmenero JD, Ruiz-Mesa JD, Plata A, Bermúdez P, Martín-Rico P, Queipo-Ortuño MI, et al. Clinical findings, therapeutic approach, and outcome of brucellar vertebral osteomyelitis. Clin Infect Dis 2008;46:426-33. Ioannou S, Karadima D, Pneumaticos S, Athanasiou H, Pontikis J, Zormpala A, et al. Efficacy of prolonged antimicrobial chemotherapy for brucellar spondylodiscitis. Clin Microbiol Infect 2011;17:756-62. Kim CW, Perry A, Currier B, Yaszemski M, Garfin SR. Fungal infections of the spine. Clin Orthop Relat Res 2006;444:92-9.
van Ooij A, Beckers JM, Herpers MJ, Walenkamp GH. Surgical treatment of aspergillus spondylodiscitis. Eur Spine J 2000;9:75-9. Bettini N, Girardo M, Dema E, Cervellati S. Evaluation of conservative treatment of non specific spondylodiscitis. Eur Spine J 2009;18 Suppl 1:143-50. Frangen TM, Kälicke T, Gottwald M, Andereya S, Andress HJ, Russe OJ, et al. Surgical management of spondylodiscitis. An analysis of 78 cases. Unfallchirurg 2006;109:743-53. Darouiche RO. Spinal epidural abscess. N Engl J Med 2006;355:2012-20. Hadjipavlou AG, Mader JT, Necessary JT, Muffoletto AJ. Hematogenous pyogenic spinal infections and their surgical management. Spine (Phila Pa 1976) 2000;25:1668-79. Karadimas EJ, Bunger C, Lindblad BE, Hansen ES, Høy K, Helmig P, et al. Spondylodiscitis. A retrospective study of 163 patients. Acta Orthop 2008;79:650-9. Lin Y, Chen WJ, Zhu WT, Li F, Fang H, Chen AM, et al. Single-level lumbar pyogenic spondylodiscitis treated with minimally invasive anterior debridement and fusion combined with posterior fixation via wiltse approach. J Huazhong Univ Sci Technolog Med Sci 2013;33:707-12. Ghobrial GM, Al-Saiegh F, Franco D, Benito D, Heller J. Lateral lumbar retroperitoneal transpsoas approach in the setting of spondylodiscitis: A technical note. J Clin Neurosci 2017;39:193-8. Deininger MH, Unfried MI, Vougioukas VI, Hubbe U. Minimally invasive dorsal percutaneous spondylodesis for the treatment of adult pyogenic spondylodiscitis. Acta Neurochir (Wien) 2009;151:1451-7. Pola E, Autore G, Formica VM, Pambianco V, Colangelo D, Cauda R, et al. New classification for the treatment of pyogenic spondylodiscitis: Validation study on a population of 250 patients with a follow-up of 2 years. Eur Spine J 2017;26:479-88. Staatz G, Adam GB, Keulers P, Vorwerk D, Gunther RW. Spondylodiskitic abscesses: CT-guided percutaneous catheter drainage. Radiology 1998;208:363-7. McHenry MC, Easley KA, Locker GA. Vertebral osteomyelitis: Long-term outcome for 253 patients from 7 cleveland-area hospitals. Clin Infect Dis 2002;34:1342-50. Kowalski TJ, Berbari EF, Huddleston PM, Steckelberg JM, Osmon DR. Do follow-up imaging examinations provide useful prognostic information in patients with spine infection? Clin Infect Dis 2006;43:172-9. Zarrouk V, Feydy A, Sallès F, Dufour V, Guigui P, Redondo A, et al. Imaging does not predict the clinical outcome of bacterial vertebral osteomyelitis. Rheumatology (Oxford) 2007;46:292-5. Fransen BL, de Visser E, Lenting A, Rodenburg G, van Zwet AA, Gisolf EH, et al. Recommendations for diagnosis and treatment of spondylodiscitis. Neth J Med 2014;72:135-8.